8 outlets - 4 timed/4 constant. 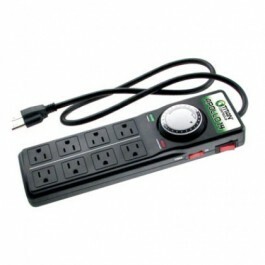 24 hour mechanical programmable timer with 15 minute intervals. Heavy duty construction. All outlets surge protected up to 1000 joules. Circuit breaker switch. 5 ft power cord set. Plastic enclosure resists dust, rust and moisture. Not for use with digital ballasts. 15 Amps maximum/120 Volts/60 Hz.